When you were young, you may have said that you wanted to one day be the President or a congressman so that you can fight for democracy and the rights of people, and solve all of the issues in this world. In fact, it seems as though such aspirations are right there with being a firefighter or police officer for most young children. I had these aspirations myself once (and still sometimes do). But as we grow older, we see the reality of politics. It is a career filled with risks, publicity, and citizens united in their apparent hate for you and your political stand. Instead of glamorous speeches and massive houses, you are just as likely to end up unemployed. Politics is a complicated career path, and even those who are successful see a variety of major setbacks in their careers. So is there any money to be made in being a career politician? Maybe, if you are successful. Let’s take a look at some of the financial considerations of a political career. When we look at politicians, many of them do make a substantial income. President Obama makes $400,000 per year, which is obviously a massive salary. And that doesn’t even count all of the benefits he gets, like living in the White House and having constant security, and having plenty of influence all around the globe. The next step down the ladder would be Congress. Members of the House of Representatives make $174,000 per year, plus benefits. This is similar to the levels seen in Canada, where members of Parliament make a $157,731 salary and the Prime Minister makes $315,462. And while those are fantastic salaries, remember that those are the upper levels of national governments. Being President of the United States is like being the CEO of one of the biggest companies in the world, all of whom make many times what the President does. If you are at the lower levels of political ladder, you may not make as much. Salaries for local and state political positions range from barely above the poverty line up till about $100,000. Another thing to consider about a political career is that the pay may be unstable. One year you may hold a position that pays well, but the next you could be voted out and be forced to find a new job. This instability is part of the nature of a career that relies on being elected for terms in office. Depending on what office you are seeking, this may be a very short or very long term. In the US, Senators get six year terms while members of the House only get two, for instance. Of course, a huge consideration to take into account is the cost of running political campaigns. You will be able to get donations to help fund your campaigns, but that may not be enough. Especially for lower level local positions, campaigns are oftentimes paid out of pocket by those who are running for the position. While you won’t have to spend the millions of dollars that presidential candidates do if you are running for mayor of a small town, you can still expect a big chunk of change will need to be spent in order to get elected. Remember that advertising yourself to voters in any form is always expensive, and it may be needed to win the elections. Thinking about campaign finance while campaigning might just make your head ache and make you wish you weren’t running. So is there money to be made in politics? Sure, but it can be hard to reach high paying levels, the pay is unstable, and most of your money will go right back into campaigning. There is a reason that most politicians have already had successful careers in other places. But if you are determined, there is no reason to not become a politician. In fact, it can be a great career choice if you are determined. Author Bio: James Petzke is the writer behind This Is Common Cents. He writes mostly about building wealth through frugality and living meaningfully, and he hopes to one day hold national political office. I would hate to become a politician, especially with how the election cycle seems to have just gotten longer. I think the real earning potential, for well-known national politicians at least, is when they leave office and are able to take on speaking engagements. Yeah you are right about that, many politicians leave office and make millions based on their reputations from when they held office. The real money is in the speaking engagements and books they release, either while in office to after. There’s also the possibility of private employment with a corporation after your stint. People that are familiar with and know how the behind the scenes deals are made in DC are in high demand and get paid ridiculous amounts of money by corporations that want to influence policy. I would never want to be a politician. There isn’t a soap strong enough or a shower with enough hot water to wash the icky feeling off! Yeah just look at George W. Bush, despite his low approval ratings, he no doubt made millions with the book he wrote about his presidency. I was about to say pretty much exactly what Jose said. The money in book deals and speeches is huge. Many people seem to share your opinion, that is for sure. Political office just isn’t for everyone. Lower level politicans don`t earn much in Norway either, but I think the real money is what they do in their private time; being consultants, writing books etc. Of course there is money in politics. Back in my home-state of NJ, being a member of the state legislature is considered “part-time” and pays $30,000 Not bad for a part time job! If you compare that to being a CEO or some finance position, that is small potatoes. But for millions of Americans, that is a pretty solid salary. Heck, it’s almost what my wife makes working full time! Of course, where the real money comes in is the great revolving door of lobbying. Once you’ve been an elected official, you are qualified to be a lobbyist. Get in with one of the big lobbying firms and you will make more than you did in public office. Lobbying firms can pay huge amounts of money, which is a great avenue to make money for former politicians. I wouldn’t touch being in politics with a 10 foot pole. That is not something that I would want to do and the pay would not be enough for me to deal with the corruption and just plain out lies that we hear on a local and national level. 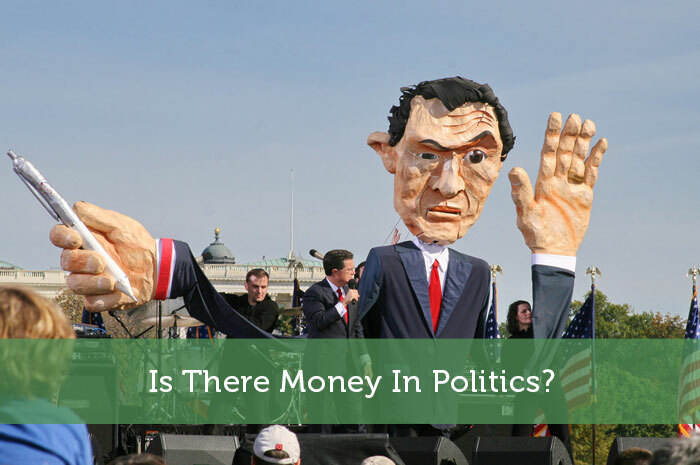 Yes, there is money in politics and that is why most people try to stay in it when they get in. You have to wonder if there really is as much corruption as many people claim in politics. Certainly not all politicians are totally evil. Just food for thought. There is no amount I could be paid that would possibly be enough. The only good reason to get into politics is purely for public service but you would continually be opposing self-serving dirtbags and those pushing one corporation or another. It would just be so incredibly frustrating if you were actually hoping to accomplish anything of substance. The public service aspect of things is huge, and that is why many people get into it. It really is a pretty selfless way to contribute to society. Well man, I gotta say, this is one thing that pisses me off. THe idea of a “poltiical career.” There should be no such thing. We’re all supposed to have regular jobs. And then give up our regular job for a short period of time to represent our fellow dudes from our community. And then after that little bit of time, return to our regular job. And the time that we spent representing our community was a public service…which means, no real money to be made. The idea of a political “career” seems all wrong to me. You can’t represent me if you’ve never had a regular job like me but have only ever been in politics. I would totally agree with you on this, but I think we also need to realize that is how things are in America right now. There’s a TON of money in politics. It dawned on me during the last campaign that you have two options. or get mad because of politics. I think bloggers who are scared to talk about the morons who act like they represent us are missing a huge opportunity. Why not spice things up and have some fun with these clowns in suits? That is a pretty interesting take. Especially during election season, you are right about the potential for bloggers in politics. If you make it far enough up the political ladder you can also score some pretty sweet retirement benefits! Some of the best retirement benefits in the world go to politicians! There’s no way I’d get involved with politics as I simply have no interest in it, full-stop. Money, you bet there is especially high profile. Most people don’t, and understandably so! I think this has been said, but there is money not just in the politics but also in the publicity that politicians get. It opens up a new money-making world for them if they aren’t successful making money in just politics. Many politicians do just that. I think most of the money in politics comes after the fact. Consulting gigs pay millions of dollars to people who can navigate the political landscape. There is a lot of potential there for sure. You know, I don’t even think it’s the direct salaries that we should be concerned with. It’s well known that power draws money and that corruption is something we need to continuously battle. For every person we catch, there must be like 10 that we don’t. I have to admit I’ve been watching a lot of House of Cards, but still, I’m sure the show is closer to reality than we think! It is really hard to totally eliminate corruption. Maybe even impossible! The flip side is the money that can be made after leaving politics. Just look at Bill Clinton. Now Hilary will be commanding the same huge speaking fees. Lyndon Johnson made his fortune while in public life, he and his wife owned many broadcasting entities, I’m sure his position in the Senate didn’t hurt him at all. It is the ultimate stepping stone for getting public exposure. It’s pretty crazy how much former politicians can pay for speaking fees after they are done with politics. Of course, that is for high level politicians. Lower end politicians instead could use their fame to get decent jobs afterwards, especially if they did anyone special favors. Yes there is money in politics and that is the problem. Our forefathers went into politics as public servants/statesmen, many now go for the pay and the benefits, not to make sure the constitution is followed as originally intended. I’m not sure how much of a problem it is. They need high pay to attract the most qualified people, otherwise they’d instead go work for a private company. There are definitely those that get way more than they deserve though. Hello, I am actually very interested in becoming a politician; however, I don’t know where to start. I do very well in school, and am signed up for AP Government/Economics. The ethical aspect of politics isn’t really a huge concern for me. In all pursuits you must do some unethical things in order to succeed. I just wan’t to be someone important who makes decisions for the well being of others. Anyone have any advice? Any, and all responses are greatly appreciated. Also, I am a high school Junior.